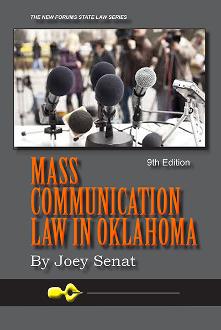 MASS COMMUNICATION LAW IN OKLAHOMA brings between two covers a valuable reference to state law affecting communication professionals and students. Written for the layperson, it examines issues that occur in daily news-gathering activities, such as libel, open records, and reporter privilege. Media law is consistently evolving, and Oklahoma law is no exception. With timely updates covering this dynamic field, Mass Communication Law in Oklahoma will earn its place on every media professional's desk. Joey Senat is an assistant professor at Oklahoma State University’s School of Journalism and Broadcasting, where he teaches mass communication law and news-editorial courses. Dr. Senat was named Outstanding Professor in OSU’s College of Arts and Sciences for the 1999-2000 school year. He has written a number of research articles and papers regarding First Amendment and freedom of information issues. He is a member of the editorial board of Newspaper Research Journal and is teaching chair for the Law Division of the Association for Education in Journalism & Mass Communication. Prior to being a college professor, he was a reporter for The Commercial Appeal in Memphis, Tenn., and the Tulsa (Okla.) World. He earned a bachelor’s degree from Louisiana State University, a master’s from Memphis State University and a doctorate from the University of North Carolina at Chapel Hill. Dr. Senat can be reached online at http://journalism.okstate.edu/faculty/jsenat/.